Ecstasy is an incredibly common synthetic drug that is widespread in New Jersey. 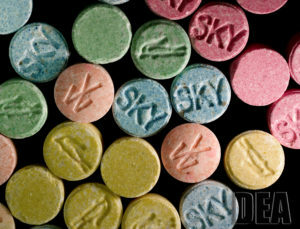 It is often called Molly, or MDMA, which is the abbreviation for the chemical methylenedioxy-methamphetamine. While ecstasy was once found primarily in clubs, it is now used recreationally on college campuses, at concerts, at house parties, and throughout New Jersey. The drug MDMA is similar to stimulants and hallucinogens and it creates some of the same sensations, including increased energy and euphoria. Ecstasy can be snorted in powder form like cocaine or taken in a tablet or pill like many prescription drugs. Under current NJ law, it is illegal to possess or distribute ecstasy under any circumstances. Doing so can result in serious drug charges and penalties that can haunt you for the rest of your life. If you have been charged with MDMA possession or distribution, you need an experienced attorney who can work to minimize or avoid the potential consequences of a conviction. At The Tormey Law Firm, our Morris County criminal defense lawyers have successfully defended countless clients charged with drug crimes in courts across the state. Our team includes a former Morris County Prosecutor and our firm’s founder has been recognized among the Top 10 Criminal Lawyers in New Jersey by the American Jurist Institute. With offices in Morristown, we appear in Morris County courtrooms on a regular basis, including in Denville, Rockaway, Parsippany, Madison, and Hanover. To read some of our many successful results in drug cases, visit our success stories page. You can also contact us anytime at (908) 336-5008 for a free consultation about your ecstasy charges. 3,4-methylenedioxy amphetamine is classified as a Schedule I Controlled Dangerous Substance in New Jersey. This designation means it (1) has high potential for abuse; and (2) has no accepted medical use in treatment in the United States; or lacks accepted safety for use in treatment under medical supervision. MDMA can take a variety of forms, so this classification encompasses any material, compound, mixture or preparation which contains any quantity of methylenedioxy amphetamine. Since ecstasy is a Schedule I drug, it is a third degree crime to possess any amount of MDMA in New Jersey. Third degree crimes are punishable by a prison sentence ranging from 3 to 5 years. However, third degree crimes entail a presumption of non-incarceration, which means if you have no prior criminal record, you may be eligible for the Pre-trial Intervention Program (PTI). You can only use a diversionary program like PTI once in your life but if you successfully complete the program, the charges against you are dismissed. Third Degree Ecstasy Distribution or Possession with Intent to Distribute: if the offense involves 0.5 ounce of ecstasy or less. This degree of crime is punishable by 3 to 5 years in New Jersey State Prison, and there is a presumption of non-incarceration for first-time offenders. Second Degree Ecstasy Distribution or Possession with Intent to Distribute: if the offense involves between 0.5 and 5 ounces. This degree of crime is punishable by between 5 and 10 years in New Jersey State Prison, and there is a presumption of incarceration for first-time offenders. First Degree Ecstasy Distribution or Possession with Intent to Distribute: if the offense involves over 5 ounces. This degree of crime is punishable by a prison sentence of between 10 to 20 years, and there is a presumption of incarceration for first time offenders. If you were arrested for possession of ecstasy or distribution of MDMA in Morris County or elsewhere in New Jersey, hiring the right attorney can truly spell the difference between a momentary legal issue and permanent damage to your future. Contact our drug charge defense attorneys anytime at (908) 336-5008 or reach out online to schedule a free consultation. We also provide appointments at our conveniently located Morristown office.